The restoration of many religious buildings in Moscow has provided Muscovites and visitors to the city – both religious and secular – with new spiritual, cultural and architectural treasures. In the early 20th century, Moscow was one of the most prayerful cities in the world. By 1917, it had nearly 1,000 churches and other places of worship, representing all the major faiths, although Orthodox Christianity was the official religion of the Russian Empire. It was in Moscow, at the Kremlin’s Assumption Cathedral, that Russian emperors were crowned, even after St Petersburg became the new capital and political centre of the country in the 18th century. When the atheist Bolsheviks took power in 1917, it became dangerous to be a practising religious believer in Russia, and the country’s centuries-old religious heritage started to be systematically destroyed. Only a quarter of Moscow’s ecclesiastical institutions survived; by 1990, just over 250 places of worship remained in the city. In the Eighties, the authorities began to gradually reopen the remaining churches and return religious property to worshippers. The rebuilding of Russia’s main and largest cathedral, the Cathedral of Christ the Saviour, symbolised this movement. Built in the 1880s to commemorate the victory over Napoleon, it was blown up on Stalin’s personal orders in 1931. The site was used for a public swimming pool before the cathedral was eventually rebuilt in the Nineties. Novodevichy Convent’s thick red-and-white walls have housed many a high-ranking nun (not all of whom chose their vocation voluntarily), including Peter the Great’s sister Princess Sophia. Now surrounded by a picturesque little park, it is a wonderful place for peace and quiet in the heart of the city, where you can listen to the toll of bells instead of car horns, and watch ducks paddle peacefully on a tranquil pond. 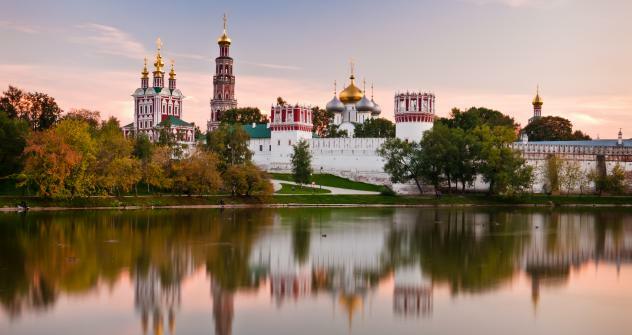 One of Moscow’s most impressive monastic institutions, built in the lavish Moscow baroque style in the 16-17th centuries, the convent was declared a Unesco World Heritage Site in 2004. A large-scale restoration, completed in 2010, has returned the convent back to its former splendour, and it now attracts an ever increasing flow of visitors. Since the government began turning Orthodox property back to religious groups, there has been an ongoing debate over whether these precious shrines and objects should be safeguarded by the church or by museums, especially since many of them are very valuable. Before it was completely returned to the Russian Orthodox Church last year, the convent housed a branch of the State Historical Museum. Catholic churches have always been rare in Moscow. There were three before the Revolution; of these, only two remain. This year, however, Moscow’s Catholics are celebrating a double anniversary: 20 years since the Catholic Church reopened in Russia, and 100 years since the construction of the Cathedral of the Immaculate Conception of the Blessed Virgin Mary on Malaya Gruzinskaya Street. The cathedral, which is said to be inspired by Westminster Abbey, was closed in 1938, its beautiful neo-Gothic façade changed significantly, with many of its more impressive elements removed. In the Nineties, it was restored with the help of donations from charitable organisations and Catholics all over the world. The cathedral’s superb acoustics make it a good venue for concerts, which are also popular with the secular public. For instance, organist James McVinnie, who played at the wedding of Prince William and Kate Middleton, performed here this month. “You can hear a real organ not only during concerts but also at every service,” says Lyudmila, a member of the parish. Unlike places of worship for certain faiths, synagogues don’t have to be built according to specific architectural requirements and can be located in an ordinary room of any building. Nonetheless, synagogues in Moscow are becoming increasingly impressive, architecturally. The reconstruction by architect Sergei Estrin of the synagogue at 6 Bolshaya Bronnaya was recognised as one of Moscow’s top architectural projects in 2005. Through the five-storey building’s glass front, you can see the restored façade of the synagogue as it appeared when it first opened in 1883. The original grand building was funded through donations from Lazar Polyakov, an industrialist, banker and philanthropist. “It was then a two-storey building, a former mansion that was redesigned as a synagogue,” explains Shlomo, a translator at the synagogue. During the Soviet years, the synagogue was closed, and it became the House of Artistic Creativity Services before being returned to the Jewish community in 1991. Today, it houses a kosher restaurant on the roof of the building, called Jerusalem, which is open to all. The youngest of the three Moscow mosques, the Minskaya Street memorial mosque was opened in September 1997 to celebrate the city’s 850th anniversary. It is dedicated to the memory of Muslim soldiers who died in the Second World War. This mosque is part of a larger complex called Victory Park, which also houses a synagogue with a museum and the Orthodox Church of St George the Victorious. The idea behind the park was to commemorate all those who fought for their country, regardless of their religion. People there are welcoming and friendly, even to those who come out of curiosity. They explain the etiquette expected in a mosque, offer tours of the building and invite you to attend the imam’s public lectures. There are about two million Muslims in Moscow and the number is growing steadily, mainly due to migration from former Soviet republics.